Mueller Hall is located within the National Herbarium in the Royal Botanic Gardens, Melbourne. The National Herbarium of Victoria building is home of the State Botanical Collection. The curved extension was built in 1989. 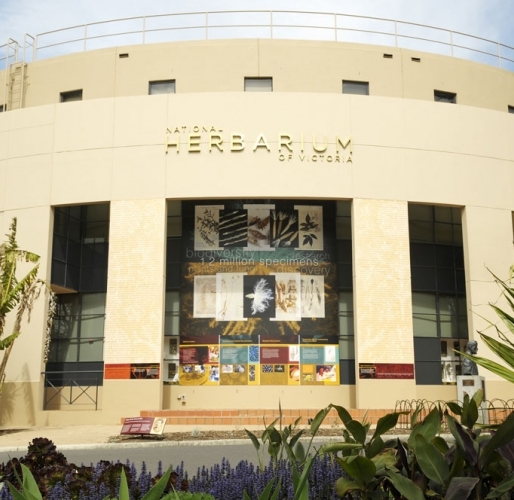 The State Botanical Collection at Royal Botanic Gardens Victoria (MEL) comprises a collection of approximately 1.5 million dried plant, algae and fungi specimens from all around the world. The majority of the collection is Australian, with a particular emphasis on the flora of Victoria. MEL's collection is rich in historical specimens and foreign-collected specimens: about half of the specimens were collected before 1900, and one third were collected overseas. The National Herbarium of Victoria at Royal Botanic Gardens Victoria is the oldest scientific institution in the state. It was founded by Ferdinand von Mueller in 1853 when he was appointed the first Government Botanist of Victoria. Mueller was an outstanding botanist and a prolific collector. He named and described more than 2,000 new species, and acquired over half of MEL's existing collection. Friends of the Royal Botanic Gardens Melbourne Inc.